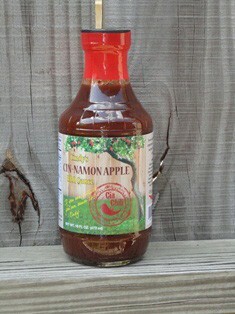 For an unbelievable BBQ experience, use this sauce on Beef, Pork, Chicken or Shrimp. As Cindy says - "If you can grill it, you can sauce it!" Ingredients: Tomatoes, Apple Jelly, Lemon Juice, Apple Cider Vinegar, Corn Syrup, Molasses, Yellow Mustard, Brown Sugar, Liquid Smoke, Cayenne Pepper, Caramel, Black Pepper, Cinnamon, Garlic Powder, Onion Powder and Spices.